For some time now, my repertoire of Tart / Pie Doughs has included four dependable recipes: Pate Brisee for flakey, Pate Sucree for sweet, Pate Sablee for crumbly and Puff Pastry for, well, puffy. 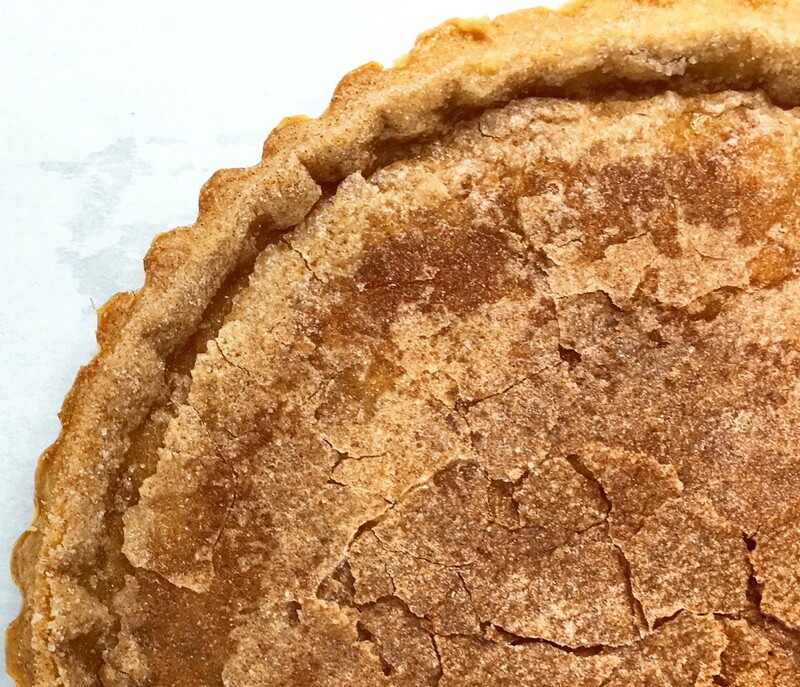 Today, Snickerdoodle Sour Cream Dough joins the list, ceremoniously claiming a spot at the very top. Why should there be such acclaim for a wet mass of Flour? 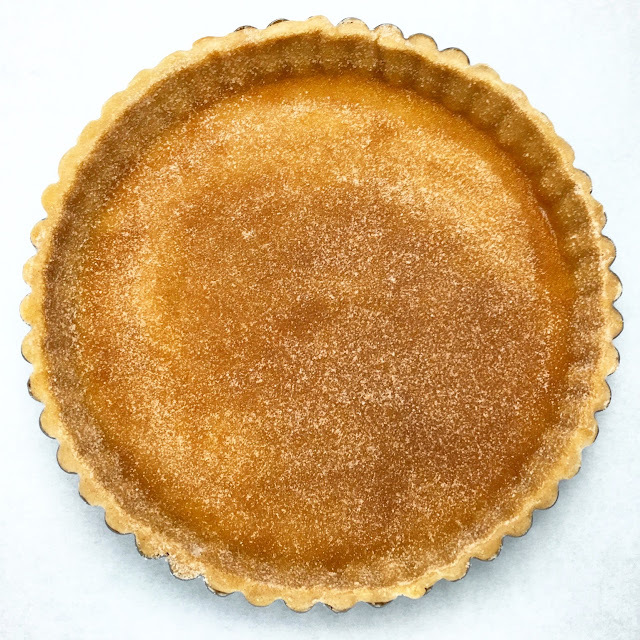 Well, this Dough successfully steals the best characteristics of several other classic recipes, becoming my top pick for dessert Tarts and Pies. Even though it took extensive testing (some trials were cakey while others were unappetizingly chewy and gelatinous - tasty, no? ), the final recipe is very simple. As with Pate Brisee, cold Butter is cut into Flour - an important technique for producing a flakey crust. But rather than use water to hydrate the Dough, this recipe uses Sour Cream. That simple substitution brings an entire world of flavor (and fat) to the Dough resulting in a richness that eclipses a traditional Pate Brisee. And while it could be used in an unadorned state for both sweet and savory applications, by covering the Dough with Egg Wash and a mixture of Cinnamon & Sugar prior to baking, the sweet result surpasses a basic Pate Sucree or Pate Sablee without question. Some new recipes come out perfectly on the first try. This one did not. But several rounds of testing were worth it. The final recipe produces the perfect Dough for a sweet, flavorful and flakey Tart or Pie Crust. Behold, Sour Cream is magic! 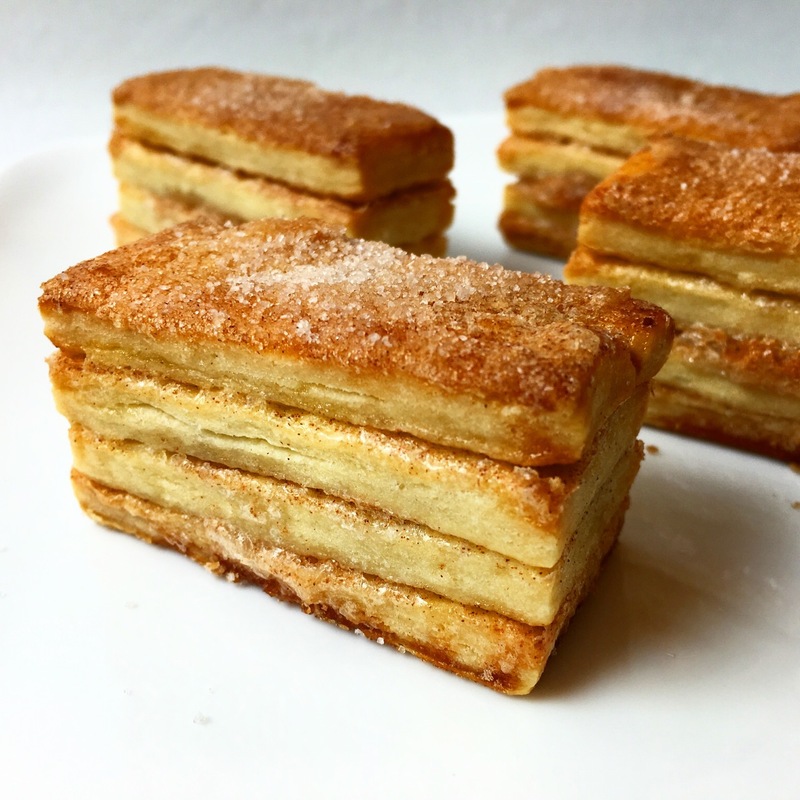 Stealing the best parts of several different Dough recipes, this recipe is most similar to a Pate Brisee based on the cut-in-butter method of mixing. The first step in making the Dough is called "Sablage", a French term referring to the process of breaking down cold (very cold) cubes of Butter into Flour to create a sandy mixture. Break the Butter into pea or lentil sized pieces in Flour using your hands, a pastry cutter, or in the bowl of an electric mixer fitted with a paddle attachment or in a food processor. The Butter must be kept very cold during this process. If it begins to melt, it will start to hydrate the Flour resulting in a tough textured final Crust. Flakiness depends on small, solid pieces of Butter getting trapped inside the Dough. Hydrating the Dough is a process by which the Flour is bound together around those small pieces of Butter by some liquid. With a Pate Brisee, that liquid is plain, boring water. Here, it is Sour Cream. Using Sour Cream to hydrate the Dough produces an infinitely richer and more flavorful Crust. But Sour Cream reacts differently than water. Water is just water. Sour Cream is water and fat and protein and sugar. As a result, more Sour Cream is required to sufficiently hydrate the Dough - almost 50% more! When hydrating the Dough, the goal is to add just enough Sour Cream so that the Dough just holds together into a ball. Add too much moisture, and the Dough will be sticky. Add too little, and the Dough will crumble apart. It is also important to stop mixing the Dough as soon as it comes together. Once the Dough is hydrated, further mixing develops more gluten, which will make the Dough elastic and tough. To improve the texture of the Dough after mixing, let it rest for at least 30 minutes before rolling. Wrap the Dough in plastic wrap and let it chill in the refrigerator. Once the Dough is rested, it can be rolled and used to fill various Tart and Pie molds. The thickness of the Dough will depend on the product, but 1/8" - 1/4" thickness is common for most pastries. After the Tart or Pie molds are filled with the Dough, let them rest and chill once again before baking. After the final resting and chilling period, trim the excess Dough from the edges of the molds with a sharp paring knife. Unbaked Tart and Pie Crusts can be wrapped in plastic wrap and stored in the refrigerator for up to a week or frozen for several months. Crusts with baked fillings can be filled and baked immediately. Crusts with unbaked fillings can be docked (only if the filling will not be too liquid) or filled with pie weights to prevent bubbling during baking. The Crust can then be blind baked at 350 degrees Fahrenheit (177 degrees Celsius). 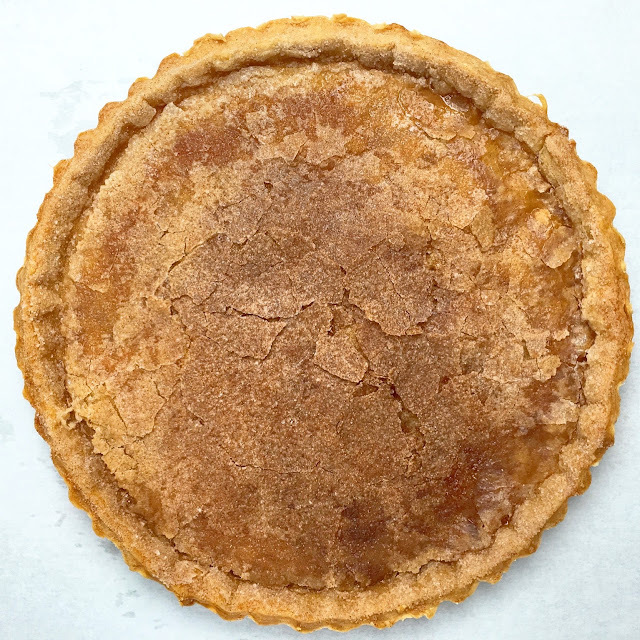 Baking times will vary based on the thickness of the Crust and the size of the Tart or Pie. Blind baking typically takes up to 30 minutes. A Crust is sufficiently baked when it is golden brown in color and fully dry on the bottom. Filled or unfilled, any exposed pieces of Dough should be brushed with Egg Wash and, in the case of desserts, generously sprinkled with Cinnamon and Sugar - truly Snickerdoodle. The Sour Cream Pie Crust Dough can be refrigerated for a week or frozen for several months. The Dough should be tempered, but still cold, before rolling. Blind baked Crusts keep for up to a week wrapped in plastic wrap at room temperature. 1. Place the Flour, Sugar, Salt, Cinnamon and cold Butter in an electric mixer fitted with a paddle attachment. 2. "Sablage" the Dough: Mix the ingredients on medium speed until the cubes of Butter are broken into small, pea-sized pieces and are well-coated in Flour. The mixture should take on a coarse, sandy appearance. Chef's Note: Make sure the Butter is very cold. If the Butter is warm, it will begin to melt and form a paste with the Flour rather than break into small pieces. 3. With the mixer on medium speed, add 90g (6 Tbls) of Sour Cream and mix until the Flour and Butter come together to form the Dough. Use the additional 15g (1 Tbls) of Sour Cream if the mixture is too dry. When adding the Sour Cream, the goal is to add just enough moisture so that the Flour can hold together around the small, solid pieces of butter. Chef's Note: The type of Sour Cream used, as well as environmental factors such as humidity, will change the amount of Sour Cream needed to form the Dough. Do not over-mix the Dough once the Sour Cream has been added. When moisture is added to Flour, gluten begins to form. Mixing makes the gluten bonds stronger, and stronger gluten bonds make for a tougher the final product. 4. Scrape all of the Snickerdoodle Sour Cream Pastry Dough together into a ball. Portion the Dough as necessary for your specific needs (approximately 240g is needed for one 8"/9" tart). Wrap the Dough in plastic wrap and refrigerate it for at least 30 minutes before rolling. Chef's Note: Small streaks of butter should be visible in the final Dough when it is rolled out. A soft and sticky Dough has been over-hydrated. A crumbly Dough is under-hydrated. 5. Roll and bake the Snickerdoodle Sour Cream Pastry Dough according to your specific recipe needs. Rolling the Dough to 1/4" thickness and baking it at 350 degrees Fahrenheit (177 degrees Celsius) is appropriate for most uses. 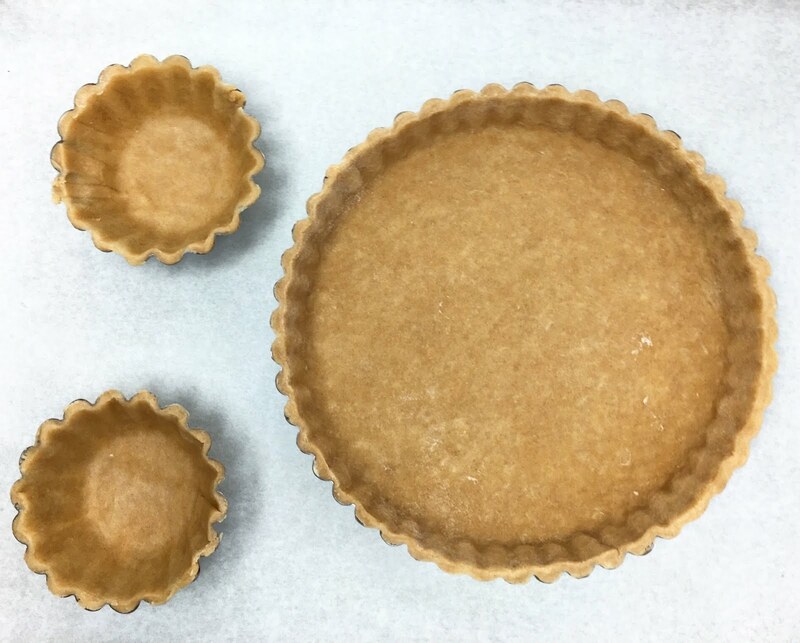 The baking time will vary based on the size of the Tart / Pie and the nature of the filling. Brush the Dough with Egg Wash and liberally dust it with a mixture of Cinnamon and Sugar before baking. - The Sour Cream Pie Crust Dough can be refrigerated for a week or frozen for several months. The Dough should be tempered, but still cold, before rolling.